Trivia is really fun here on Tuesday nights at 7pm. The downside is that they made the bar area where the trivia is played way too small and they didn't have speakers on the family side of the restaurant to play. That needs to be done! As far as food it is standard restaurant with choices for everyone. The chicken tenders are large. The mozzarella sticks are fresh made and large. The service is good. Wish they could get more music acts here on Friday and Saturday nights and go until midnight since everywhere else closes at 11pm on those nights. My wife and I decided to check out this location for lunch after church today. A friend had said he really liked it. We were surprised by excellent meals. There were healthy as well as indulgent menu options. I had a steak and cheese wrap, and the steak was very flavorful. My wife got a salmon salad, and the salmon was grilled to perfection with a crispy outside and tender, juicy inside. We will be back. My friend likes their pizzas, and I look forward to sampling one. We both had turkey bacon wraps on spinach tortillas. They came with a choice of sides. My husband chose the sweet potato fries, which he said were very good, and I chose the baked apples, which were warm and delicious. The service was fast and very friendly. We recommend this restaurant! The management of Sidelines operates several sports bar type restaurants around the middle TN area. The food is consistently good, better than you would expect from a sports bar. The staff is very pleasant and attentive. If something does go wrong they bend over backwards to make it right. We love the sampler platter (they have the BEST cheese sticks). The Beer Cheese soup is available on Fridays and is addictive. Overall a consistently good place to grab a bite. 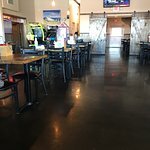 Been to Sidelines Grill? Share your experiences!